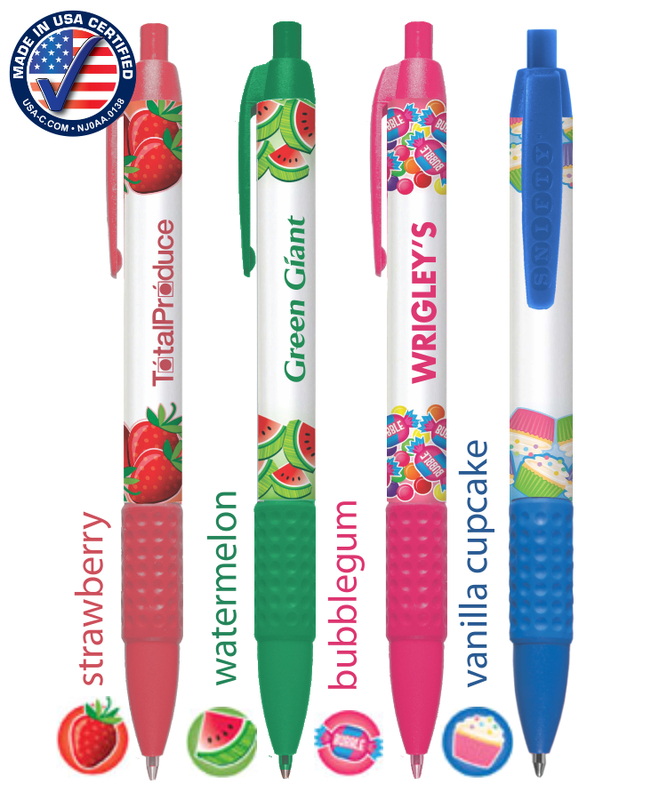 Union Printed, Certified USA Made Pre-Designed " Snifty" Scented Pen" Clicker Ballpoint Pen, "Just Add Text" model allows you to simply insert Text on this Full Color Pre-Designed Barrels this pens are available in the following scents Strawberry - white barrel with red trim, Watermelon - white barrel with green trim, Cupcake - white barrel with blue trim, Bubblegum - white barrel with pink trim. Features a Matching Rubber Grip For a smooth Writing experience, this High Quality Click Action Pen is Manufactured in the United States & Decorated in our Union Shop - Union Bug Available at No Charge! • Imprint Area: 1.25" x .625"